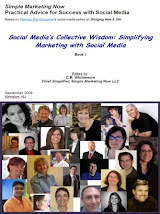 The latest issue of Simple News &amp; Insights, Now Available... and I hope you enjoy it! 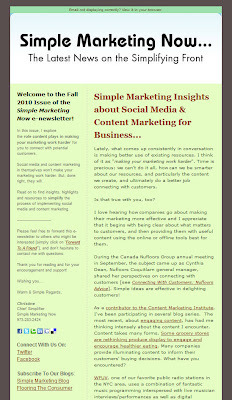 Released on 11/11/10, the Fall 2010 issue of Simple News & Insights from Simple Marketing Now is available for your reading pleasure. You can access it by clicking on this link to the 11/11/10 archive of Simple News & Insights. This issue explores the role content plays in making your marketing work harder for you so you can more effectively connect with potential customers. 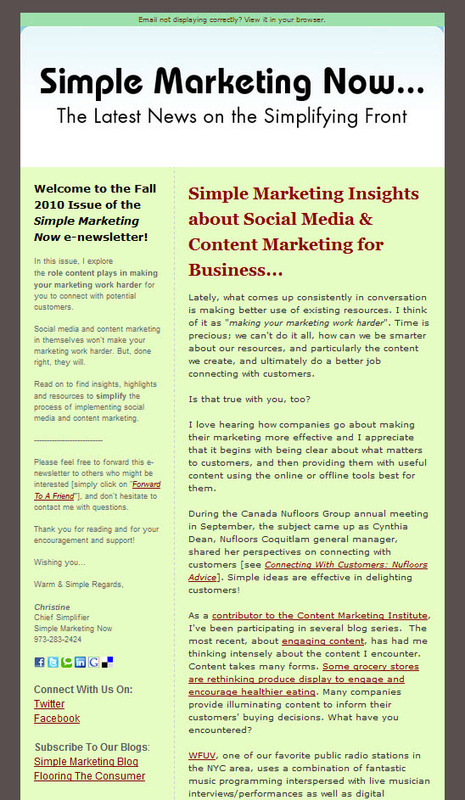 If you like what you read in the Fall 2010 issue of Simple News & Insights, please consider subscribing. To do so, simply click on this link to subscribe or look for the eNewsletter subscription form in the right sidebar of this blog. You can review archives of Simple News & Insights by visiting the Simple Marketing Now News page and scrolling down to the left sidebar. How Do I Make The Most of LinkedIn?